Not all commercial air conditioning services are created equal. Here’s what you should expect from a top tier air conditioning service in Dubai. If you’ve spent much time living or working in the great city of Dubai, you know how hot it can get. With temperatures reaching well over 100 degrees, it’s important to keep your air conditioning working. But sometimes, things go wrong and your AC malfunctions or even breaks entirely. Be it an old coil or an old unit, it’s critical that you keep employees safe. Hot employees are unhappy employees, which can lead to all sorts of problems. Before you reach for the phone to call your local AC service, make sure to read on. You’ll want to make sure you’re getting the best service for your money. Here are the top things you should expect from a commercial air conditioning service. At AC Maintenance Dubai, we understand that you have choices for your commercial air conditioning service. But we also understand that you deserve honest, friendly service that you can count on. Your AC specialists should be more than just repairmen or repair women. They should strive to always go the extra mile. Most commercial air conditioning companies have a tendency to overcharge customers. Worse, they may actively exacerbate the problem and break it more. A top AC company is going to be honest with you. They’ll level with you as if you were a friend and offer the right service at the right price. When you hire someone to fix your AC, the last thing you need to worry about is whether or not they know what they’re doing. With a quality company, you’ll get reputable workers who have the experience needed to fix the problem. A top company has workers with years of experience. Make sure you’re using a company that only hires the best and brightest. Commercial AC is too important to leave to the inexperienced. Your employees deserve to stay cool. Hiring the right person for the gig is just about more than just a good price. Of course, as the owner and operator of a business, money is a concern. Accordingly, getting the right price is of huge importance. Always make sure that your commercial air conditioning service gives you a complete rundown of services. Ask for a thorough explanation of the repair process, including the cost of labor and parts. Know what to avoid. It may just save you money in the long run. 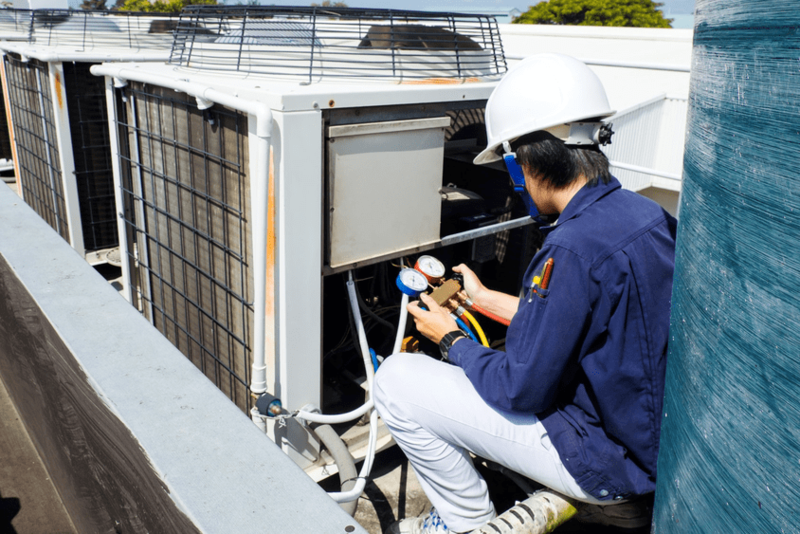 You owe it to your employees to pick the top AC maintenance company. And by getting the air conditioning repaired, you’ll likely see productivity increase. Studies show that employees are happier in a more comfortable environment. Your employees deserve a workspace they feel comfortable in, so keep them cool! These are just a few things you can expect from a top AC service. You’ll have happier employees and a better work environment, all for a fair price! Whether you’re looking for basic maintenance or need a new AC unit entirely, we can help. Get in touch and let us keep your office cooler for less.